The Vezina Trophy is awarded annually to the National Hockey League's goaltender who is "adjudged to be the best at this position". At the end of each season, the thirty NHL general managers vote to determine the winner. It is named in honour of Georges Vezina, goaltender of the Montreal Canadiens from 1910 until 1925, who died in 1926 of tuberculosis. The Trophy was first awarded after the 1926–27 NHL season and was awarded to the top goaltender. From 1946–47 to 1981–82, the trophy went to the goaltender of the team allowing the fewest number of goals during the regular season; now, the William M. Jennings Trophy is awarded for this. National Hockey League's top goaltender who is "adjudged to be the best at this position"
The Vezina Trophy is awarded annually to the National Hockey League's (NHL) goaltender who is "adjudged to be the best at this position". At the end of each season, the thirty NHL general managers vote to determine the winner. It is named in honour of Georges Vezina, goaltender of the Montreal Canadiens from 1910 until 1925, who died in 1926 of tuberculosis. The Trophy was first awarded after the 1926–27 NHL season and was awarded to the top goaltender. 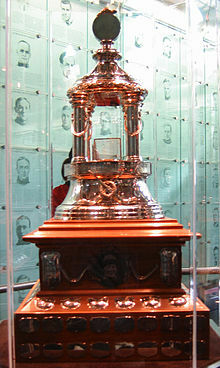 From 1946–47 to 1981–82, the trophy went to the goaltender(s) of the team allowing the fewest number of goals during the regular season; now, the William M. Jennings Trophy is awarded for this.